Occupational Therapists (OTs) are health care professionals who work with individuals or organizations to enable function and promote engagement in meaningful, purposeful lives. To an OT, occupation does not just mean "work", but rather any meaningful activity. For example, occupations include daily tasks such as brushing your teeth, using a computer, driving a car, or being productive at work. OTs work in a variety of areas including hospitals, rehabilitation centers, schools, private clinics, in the community, and in the workplace. Occupational therapy frameworks are embedded in various theories. 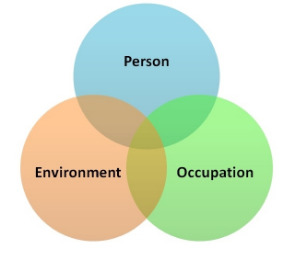 The Person-Environment-Occupation (PEO) Model demonstrates the interconnections of a person, their environment and their occupation. In order to enable occupations, an occupational therapist considers all the overlapping factors in each category. (Law M, Cooper B, Strong S, Stewart D, Rigby P, Letts L., 1996). This holistic view allows occupational therapists to be well suited to enable change with any person, for any occupation, in any environment. Thus, occupational therapists are well positioned to enable change in workplace mental health. For more information on occupational therapy in Canada, please visit the Canadian Association of Occupational Therapy (CAOT) website by clicking here. For the CAOT Position statement on workplace mental health, please click here.